After I saw “It’s Complicated,” I pondered one of the greatest questions of all: what makes a solid comedy? The answer is complicated. Though it does contain a few good gags, “It’s Complicated” doesn’t totally answer the question. I hope this opening doesn’t sound too harsh, because in the end, “It’s Complicated” is a decent comedy, but not a great one. “It’s Complicated” is what can be described as nothing more, and nothing less, than a typical romantic comedy. The film centers around the divorced couple of Jake (Alec Baldwin) and Jane (Meryl Streep). Since the divorce ten years earlier, Jake has remarried the much younger Agness (Lake Bell) while Jane remains single. After reuniting at their son’s (Hunter Parrish) college graduation, the two inadvertently rekindle their love and embark on a long, troublesome affair. It’s also worth noting that Steve Martin is in it as Jane’s love interest. It’s important to note this as the actors are truly what make the story work. The actors that make the story work are the trio of Baldwin, Streep, and Martin. As usual, it’s a pleasure to watch Baldwin’s relaxed intensity. His sternness always seems to make for the best humor. He shows this skill most on “30 Rock,” and it truly carries over here. Streep, meanwhile, is great as usual. Here she again proves that she is one of those rare actresses who can conquer any genre. It’s amazing to think she can be in something as serious as “The Deer Hunter” and something as silly as “It’s Complicated.” Streep even shows off the acting skills that a great comedian would have. These skills are visible in her body language and line delivery. At times, the chemistry between Baldwin and Streep is almost magical. When Jake talks to Jane as she soaks in the tub, the two seem so believable as a married couple. It was a rare scene in the film that could’ve kept going and I wouldn’t have minded. While Baldwin and Streep rarely seem to go wrong, this is probably the best performance Martin has given in years. He proves to audiences why he was once hailed as one of the greatest comedians out there. All he has to do is roll his eyes a certain way and you’re already laughing. While this trio of actors essentially is the movie, they don’t totally steal the show. John Krasinski (“The Office”) proves himself to be an amazingly promising comedic talent. I wish I could talk about how great the actors of “It’s Complicated” are for the rest of this post. However, I can’t ignore the film’s weak points. Its main weakness is its writing. While the film certainly has its funny moments, I can’t pinpoint one hilarious line that I could repeat for weeks to come. Also, the film doesn’t become funny until some way in and there are many long, humorous stretches. 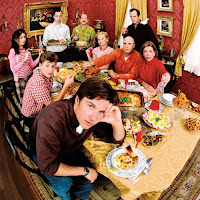 A great comedy should be consistently funny throughout. And while the film is only 118 minutes long, it feels much longer than that. It also goes without saying that the story of “It’s Complicated” is something of a cliche and many parts of the plot line are very predictable. Then again, this is likely what the average viewer was expecting when they came into this movie: an entertaining, predictable romantic comedy. But some comedies can be good by being typical; some can be even better when they try to be smart and original. 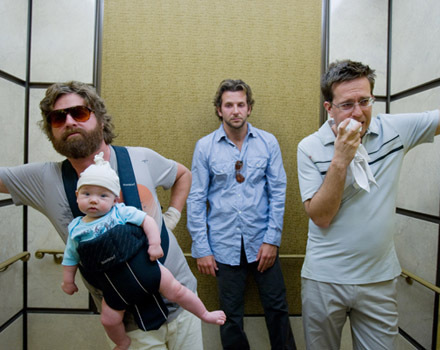 Take this year’s “The Hangover” and “Adventureland” for example. Overall, “It’s Complicated” is funny and entertaining at times, but it relies too much on its acting, and too little on its writing. 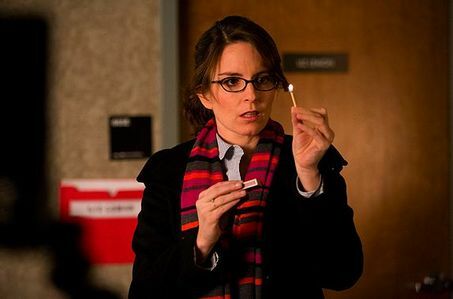 While great acting helps, the best comedies are bolstered by writers, not actors. Note: While I normally try to keep my hatred toward the MPAA out of my reviews I thought it was important to mention here. “It’s Complicated” is rated R. There is no graphic sexuality, violence, or even explicit language. The only thing that got it an R was a very funny scene involving marijuana. Believe me, an intelligent 13-year-old could handle this. This entry was posted in Alec Baldwin, Comedy, It's Complicated, Meryl Streep, Movie Review, Rom Com, Romance, Steve Martin on December 30, 2009 by ian0592. That’s the last time you put a knife in me! Y’hear me? But it is not this day! This day we fight! What business is it of yours where I come from, friendo? Okay, well maybe we should tell that to Rain Man, because he practically bankrupt the casino, and he was a ruh-tard. Maybe. Maybe not. Maybe f**k yourself. This guy is either gonna think ‘Here’s another kid with a fake ID’ or ‘Here’s McLovin, a 25 year-old Hawaiian organ donor’. What is this? A center for ants? How can we be expected to teach children to learn how to read… if they can’t even fit inside the building? Each and every man under my command owes me one hundred Nazi scalps. And I want my scalps. And all y’all will git me one hundred Nazi scalps, taken from the heads of one hundred dead Nazis. I didn’t sign up for this s**t! What other quotes might you add to this list? This entry was posted in Best Quotes of the 2000s, The 2000s on December 27, 2009 by ian0592. I won’t go as far as to say that “Up in the Air” is the best film of our time. However, should a future alien life form want to learn about our time and culture through film, they should look no further. “Up in the Air” is the kind of film we need right now; it’s one that allows the life of one man to mirror our very own existence. “Up in the Air” is based on a 2002 novel of the same name. The film version is given a 2009 financial crisis twist. Ryan Bingham (George Clooney) is a corporate downsizer, going from city to city firing people for corporations too afraid to confront their own employees. While some might face a guilty conscious doing this job, Bingham has developed an addiction to his life on the open road. In fact, he’s spent 322 days of the past year flying from city to city. Bingham’s air-bound life leaves him isolated from the rest of humanity, but he wouldn’t have it any other way. Soon enough, Bingham’s livelihood is at stake as his company moves toward computerized communication. Only another frequent flyer (Vera Farmiga) and a new employee (Anna Kendrick) could possibly help him get used to a life on the ground. “Up in the Air” is a rarity; it’s a film that takes a delicate subject and brings both drama and humor into it while keeping neither emotion from becoming overbearing. The film is led with a commanding performance by George Clooney, who shows a whole range of emotion with just one mournful stare. This works well as he portrays a character who must fire people without remorse, and therefore every emotion he might ever have is trapped inside of him. While Clooney’s acting is nothing short of fantastic here (as are the rest of the ensemble’s), this is really director Jason Reitman’s show. This is Reitman’s third feature. After “Thank You for Smoking,” “Juno,” and now “Up in the Air,” Reitman has gone three for three and proves himself as something of a force to be reckoned with. He is probably Hollywood’s most versatile young director, as he can pull off a dark social satire in just about any setting. Whether that be the halls of Congress, a suburban high school, or the corporate world, Reitman just seems to know where and when to point a camera. Like “Thank you for Smoking” and “Juno” before it, “Up in the Air” provides the in-and-out narrator bringing the audience through the painful processes of their lives. However, “Up in the Air” lacks much of the snark of his first two films and is by far his most serious one to date. In addition, this film shows off Reitman’s talent not only as a director, but as a writer as well. No situation feels contrived, and no dialogue goes to waste. Every line feels insightful into either the experience of Bingham, or life as a whole. The ability to be both a great writer and director ultimately shapes you into a great storyteller. Nowhere is that more apparent than in this film, especially in one of the film’s final, game-changing twists which you’ll just have to see for yourself. Quite possibly part of the reason why I think “Up in the Air” is so great is because I viewed it as a throwback to the greatest era in American cinema: the 1970s. Like a film out of the 70s, “Up in the Air” sets its story in a socially aware context, without hammering the viewer with politicized themes. Of everything from the 70s I can think of, “Up in the Air” feels most like a film by Hal Ashby (“The Last Detail,” “Harold & Maude”), as it contains many scenes that one could find extraneous, but which do so much to develop character. One instance I can’t get out of my head is Bingham taking pictures of a cardboard cutout of his sister and her fiance in front of famous American monuments. This serves as one of the film’s funniest running jokes, and Reitman’s ability to utilize quirky characters. “Up in the Air” also immediately made me think of “Taxi Driver,” mainly in how similar Ryan Bingham is to Travis Bickle. One might think both characters are forced into isolation by society, but it is instead their very nature to remain isolated. Clooney does the impossible in nearly channeling De Niro’s performance, minus the murderous rampages. What could best make “Up in the Air” perfect 70s cinema is its open-ended ending. While some just want films to give them an answer, the best ones, the ones we never forget, are those that let the viewer do the thinking. This is why we go to the movies: not just to be entertained, but to be challenged. Some movies are an escape from reality, while others mirror it. “Up in the Air” certainly falls into that latter category. Its a cinematic gem; the kind of film that brings you to terms with reality but manages to impress with impeccably good writing, directing, music, camerawork, and acting. “Up in the Air” works so well because its so satisfying in basically everything it sets out to do. This entry was posted in Dramedy, Financial Crisis, George Clooney, Jason Reitman, Movie Review, Up in the Air on December 26, 2009 by ian0592. James Cameron only makes a movie every 10 or so years. But every time he does, he seems to rewrite the rules of filmmaking. With “Avatar,” James Cameron not only rewrote the rules, but opened a whole new book. “Avatar” is one of those films that’s not just a film, but a vision beyond anyone’s wildest dreams; it’s daring in ways one couldn’t even imagine. Cameron’s strange yet fascinating sci-fi epic takes a few steps to break down, it’s a premise that mixes contemporary society with ancient faiths. “Avatar” takes place around the year 2154. At this point, the earth has been totally ravished by humans (and, not mentioned in the movie, run out of oil), so the human race heads toward a distant moon called Pandora. Pandora contains a race of creatures called the Na’vi, a tall, blue species with a cat-like face and human tendencies. More important to humans, the moon also contains a valuable, energy-rich rock called Unobtanium. In order to get the Unobtanium, humans infiltrate and then hope to destroy the Na’vi by slipping into their bodies in Na’vi form. These bodies are called Avatars. War veteran Jake Sully (Sam Worthington), paralyzed from the waist down, takes his brother’s place on Pandora after he dies. He is sent to become part of the Na’vi, but in the process, he becomes a powerful member of the tribe, and falls in love with a Na’vi woman (Zoe Saldana). In some ways, in different hands “Avatar” could have been a disaster, or maybe just an action film like any other action film ever made. But in the hands of a man with a real vision, “Avatar” is something totally different. “Avatar” is shot with a new form of Motion Capture technology that Cameron himself invented. This form looks stunningly real, from the monsters that live on Pandora, to the Na’vi themselves. While some forms of Motion Capture come out as uncannily unrealistic, there is something about the Na’vi that is incredibly human. The film is shown in 3-D, a usually wasteful tool to add to feature length films. It is something I usually associate with the Muppet ride at Disney World. When used in most films, the only thing it is used for is to shoot raindrops or bullets out at the audience. “Avatar,” however, uses its 3-D to make its images more stunning. It seems like more of a way to put the viewer into the film than create some means of shock value. While I hope 3-D doesn’t become a regular feature in filmmaking, if it is used for this purpose alone, then I really wouldn’t mind. The storyline of “Avatar” has many elements derived from both contemporary issues and religions. This helps turn the film into a pretty effective parable of human nature in both the past and the present. For example, Avatar comes from the Hindu faith and is the manifestation of a deity from heaven to earth. That makes sense, as Avatars are humans in Na’vi form. Also, the entire film itself seems based off the Hindu belief of reincarnation, as the wheel-chaired Jake wants so desperately to be reborn into something else. The film also seems to take on the totally unrelated ideology of Shinto, in which it is thought that people have a spiritual connection with the natural world, a connection the Na’vi share with their own planet. When looking at “Avatar” from a contemporary perspective, one could quite obviously point out that it is a highly critical look at man’s depletion of his own home. Some might even try and politicize the film for this reason, though politics should be left out of it. Looking deeper into the film, one could see that it is about the horrors of imperialism. The war between the humans and the Na’vi often mirrors the destruction of the Native Americans of the United States or the Aztecs in Central America. It is also about the human instinct to act as pillagers: destroying one land, and then moving on to the next. Moving beyond the themes, the greatest part about “Avatar” is its incredible CGI. Pandora becomes a planet that seems almost tangible. Every aspect of it, from the animals to the plants to the water, is something that could never have been thought of by anyone. In this light, one could almost say “Avatar” is the “Star Wars” of this generation that we’ve all been waiting for. Alas, “Avatar” doesn’t go without its minor flaws. At times, some of the dialogue is a little clunky. Also, the basic storyline is one that has been done before in one way or another. However, the context it is put into is totally original. The very first line of “Avatar” is, “You’re not in Kansas anymore!” This shows that in “Avatar,” you’re being swept out of your comfort zone and being taken to a place beyond the imagination. It could also be nothing less than a shout out to “The Wizard of Oz,” a film that led the way to a new dimension of filmmaking with its bold use of color. Cameron is the kind of filmmaker with the vision to accomplish this. Cameron always manages to defy our expectations. People doubted him before “Titanic” came out and they did the same with “Avatar.” Both times he totally changed the game. As Pandora was the beginning of a new frontier for humans, “Avatar” is the beginning of a new frontier for filmmakers worldwide. Note: Earlier, I accidentally wrote that Pandora was a planet, when it is in fact, a moon. We all make mistakes sometimes, and for this one, I apologize. Thanks to Cameron Bruce for catching this mistake. This entry was posted in 3D, Avatar, Dystopian Films, Epic, James Cameron, Movie Review, Sci-Fi on December 19, 2009 by ian0592. After seeing “Invictus,” I thought of a scene in “Barton Fink” where a greedy studio executive informs Fink his wrestling picture won’t work because the real drama takes place in the ring, not outside of it. Somehow, “Invictus” manages to strike a rare balance of both; making the action in the story as intense on the action on the field. Then again, I expect nothing less from Clint Eastwood. “Invictus” comes entirely from a true story. It is slightly a biopic on Nelson Mandela (Morgan Freeman). However, it’s not a rise and fall story of his entire life. Instead, it tells of the years when he became president of a post-Apartheid South Africa. Once Apartheid ended, all of the country’s racial tensions had not ended. To reunite the torn country, he looks for help in the most unlikely place: South Africa’s rugby team. In order to reunite the country, he befriends the team’s white captain (Matt Damon) and inspires the team to win the World Cup. Here is where sports and social conflict collide. You could call “Invictus” a mix of two very different genres: inspiring biopic, and inspiring sports flick. It manages to be unconventional, but not necessarily groundbreaking in both. As a biopic, it manages to show its subject as an amazing person without necessarily deifying it. As a sports flick, it manages to be uplifting without being schmaltzy. Of course, this shouldn’t come as a surprise, as the film is directed by Eastwood. Even at the age of 79, Eastwood remains as alive and energetic as he was at 29. Here, he shows off his talent for amazing, simple human interactions. Some philosophical life conversations that take place in the movie feel similar to those in say, “Million Dollar Baby.” Meanwhile, the brilliantly shot rugby sequences feel as engrossing and brutal as a real game of rugby. 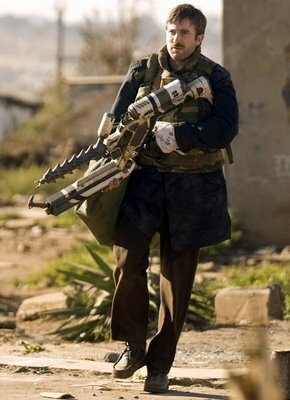 Eastwood puts in the same energy of mastering the technique of a rugby game as he did with a battle sequence in “Letters from Iwo Jima,” a boxing match in “Baby,” and a shootout between gunslingers in “Unforgiven.” Simply, this man can do anything. Another man who can do (or in the case, play) just about anything is Freeman. He’s the first person that comes to mind when I think of a good candidate for Mandela, and here he proves why. He doesn’t just play Mandela, he is Mandela. Any person who doesn’t know a thing about Mandela will walk out of this movie understanding why this man deserves a movie. He underlines his amazing quality of forgiveness, but also his outgoing, always humorous personality. His performance goes along with the screenplay, as he plays Mandela as not just an inspiring public figure, but also a man could faint from too much work, and a man who could also have family problems. The film’s other star, Damon, gives something of a mixed performance. While he gave a career best performance earlier this year in “The Informant!” this performance is a slightly bigger challenge, as the South African accent is a hard one to nail. Sometimes, he gets it right. Other times, it leans towards Australian with a mix of American. Damon is a talented actor, and I admire him for trying. However, his imperfect accent didn’t serve as a distraction from the film’s higher points. “Invictus” might just be the perfect sports movie for this day and age. It’s one of those films that provides both makes you face reality, and allows you to escape it. It engrosses you in the power of the game, but it also uses the game as a way to represent South Africa’s social problems. It represents the power of something as seemingly insignificant as a sporting event as being one of the greatest uniters of all. 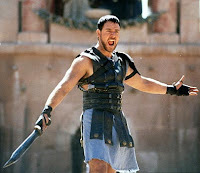 It is also a great sports flick for the way the game is shot. Eastwood puts you inside the huddles, forcing you immediately inside the action. Meanwhile, each kickoff is incredibly suspenseful. Even if you know the outcome, you can’t help but feel like you don’t. Only someone like Clint Eastwood could get away with showing one of the most significant turning points in modern human history through sports. Here, he has also shown his new world view, which is leaning away from the depravity of mankind and leaning toward the idea of how even one life can inspire so many. The title “Invictus” comes from a poem that Mandela read during his years in prison about man triumphing over his soul and his destiny and in the end, conquering great obstacles. “Invictus,” like Mandela himself, will inspire many, and leave no audience member unmoved. This is one of the year’s best films. This entry was posted in Biopic, Clint Eastwood, Invictus, Matt Damon, Morgan Freeman, Movie Review, Rugby, South Africa, Sports Film on December 13, 2009 by ian0592. I know, I too often gripe about bad films, and how they are relentlessly tearing apart the fabric of good, intelligent, filmmaking. Having said that, “The Room,” a disaster of a film, might just be one of the most rewarding film watching experiences you’ll ever have. Why is it that I’m recommending such a bad film? Quite simply, it achieves the rare feat of being so bad that its actually good. Before delving into details, it helps to have some background on the making of the film. It was the first (and to date, only) feature made by Tommy Wiseau, who also wrote and stars in the film. “The Room” had a $6 million dollar budget. Apparently, Wiseau raised most of that money selling leather jackets. It also looks like more money was put into the opening credits than in the entire story itself. In reality, much of the budget was spent on a ridiculous billboard campaign. I can’t say this for a fact, but it seems almost evident that the film’s editor was asleep throughout production and the studio executives who let it be made were likely on crack. Among its many problems, “The Room” contains so many scenes that have absolutely no value to the film. There are characters and important situations that are brought up and then never mentioned again. The dialogue is cliche and incredibly straightforward. In fact, Wiseau can’t even figure out how to use cliches properly (for instance, the placing of “love is blind”). The acting is emotionless and artificial. The camera is usually shaky and there are way too many unnecessary cuts to stock images of the San Francisco skyline. There is no doubt you’ll enjoy the film so much because you’ll be laughing at it. Sometimes, that’s what can make an extremely bad drama an extremely bad thing. Usually, a film is bad because it turns out to be the opposite of what it intended. For example, “Gigli” was supposed to be a dark comedy. Instead, it turned out to be a dark drama. “The Room” is meant to be a tragedy “with the passion of Tennessee Williams.” Instead, its a passionless laughfest. 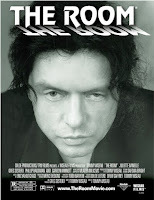 Still, what truly makes the room a cult classic is the eccentricity behind the auteur himself, Tommy Wiseau. In one scene, he tries to emulate James Dean by proclaiming “You’re tearing me apart Lisa!” In a later scene he destroys his bedroom bit by bit, a scene that is so clearly inspired by the destruction of Susan Alexander Kane’s bedroom during the climax of “Citizen Kane.” Of course, Wiseau’s thick, French accent sounds nothing like Dean, and the destruction of the bedroom scene is nowhere near as heartbreaking as the way Orson Welles filmed it. In both instances, they are flat out hilarious. Could this be why in a way “The Room” is more than just a flat out bad movie. Despite how horribly made it is, it’s so hard to hate because it feels inspired. You can sense the filmmaker was striving to show his unique vision but ultimately failed at it, much to the delight of audiences across America. All of this is more than can be said for a film like, say, “New Moon,” which is thrown together in too quick a time for the sole purpose of commercial success. I don’t think this post can really do “The Room” justice. You’re just going to have to rent it yourself or better yet, get to a midnight screening. This entry was posted in Cult Films, Ed Wood, Funny, Movie Review, So Bad its Good, The Room, Tommy Wiseau on December 5, 2009 by ian0592. Who thought that Wes Anderson, who’s still early on in a career of mastering the human frontier, could suddenly switch to the world of animated animals so perfectly? “Fantastic Mr. Fox,” for lack of a better word, is fantastic. “Fantastic Mr. Fox” is based off the book by the wildly imaginative Roald Dahl. Dahl’s source material often makes for classic cinema (mainly, the original “Willy Wonka & the Chocolate Factory”). The imaginative mind of Dahl is in good hands with the equally imaginative mind of Anderson. For those not familiar with the book, the titular Mr. Fox (George Clooney) was a former chicken thief who retired his old profession after marrying Mrs. Fox (Meryl Streep) and having their child, Ash (Jason Schwartzman). After going through what could be described as a mid-life crisis, Mr. Fox gets back into his old stealing habits and incites the wrath of the three wicked farmers Bogus, Bunce, and Bean. After they threaten his home and family, Mr. Fox prepares to fight back. 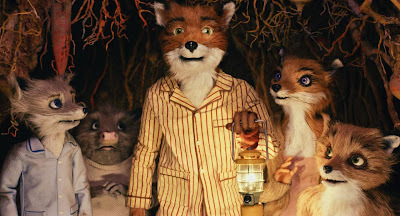 As pointed out, “Fantastic Mr. Fox” comes from the brilliant mind of Wes Anderson. Anderson is well known for directing films such as “Rushmore,” “The Royal Tenenbaums,” and “The Life Aquatic.” For a film that follows around the lives of foxes, rats, and badgers, it is still completely Andersonesque. He accounts for every tiny detail. The cozy tree the foxes inhabit is alive with color, their furniture and their walls adorned with the most intricate decorations. You might also marvel at how a computer in the background is covered with post it notes, or how the walls of the deepest parts of the earth have fossils imprinted into them. Anderson also leaves his mark with the music, which is a mixture of original score and rock music. What other director would use a Rolling Stones song in a family movie? The original score often perfectly matches the pleasant, agrarian landscape and during more suspenseful moments, takes on a spaghetti western feel. The characters themselves also feel ripped out of previous Anderson films. Mr. Fox’s mischievous behavior over family values can feel something like those of Royal Tenenbaum, and his struggle to find a real identity for himself can at times, make him seem like Max Fisher. What’s most important about Anderson’s direction is that every frame seems filled with absolute love. Rather than record the voices and sound in a studio, Anderson instead decided to record out in a farm in Connecticut. This no doubt gives the film a much more natural feeling, rather than just feeling like another artificial studio product churned out in too short an amount of time. Perhaps that’s what makes this better than the typical, how real it feels; even the animals feel human. Also, the film manages to be so adult in both theme and humor despite being a children’s film. The fact that the word “existentialism” is mentioned in it might give you an indication of it. In this light, Anderson’s adaptation of “Fantastic Mr. Fox” manages to turn this fairytale into an allegory of the human existence. At one point, Mr. Fox realizes that his days as a thief proved him to be a wild beast, and that he must settle down. The fact that he goes back to his old ways shows the wild, untamed beast that is the basis of our existence. Here, is the key to existentialism. But I don’t want to get into philosophy. After all, this is meant to be a fun story for the family, and at that it succeeds admirably. For some reason, as I watched this film, I couldn’t stop thinking of the other children’s film made by a mature filmmaker this year: “Where the Wild Things Are.” Both were experiments of whether their directors could reach to new audiences. “Fantastic Mr. Fox” wins in this experiment not just because its well filmed, not just because it has depth, but for one small reason alone: it’s an amazingly fun time at the movies. This entry was posted in Adaptations, Animals, Animation, Family Films, Fantastic Mr. Fox, Movie Review, Roald Dahl, Wes Anderson on November 25, 2009 by ian0592.